The promise of satellite TV was simple: One satellite dish, 18″ in diameter, gets all your channels. That was in 1994, when DIRECTV launched. At that time, the DIRECTV receiver was about the size of a pizza box. Now, in 2016, the smallest DIRECTV receiver is about the size of a paperback book — and it gets HD, video on demand, Pandora, and a lot of other stuff… but the dish is about twice the size. DIRECTV Genie clients are even smaller, and some TVs have DIRECTV clients built in, making the size totally irrelevant! By now, you’d think the dish would be about the size of a dime, right? Unfortunately there are other forces at work here. When DIRECTV launched, it used a single satellite, in orbit in the sky south of Lubbock, Texas. As they needed more channels, they added more satellites, but they ran out of room in that location. The FCC licenses satellite positions over the US and they require a lot of separation between satellites. So, DIRECTV went shopping for space in other locations. 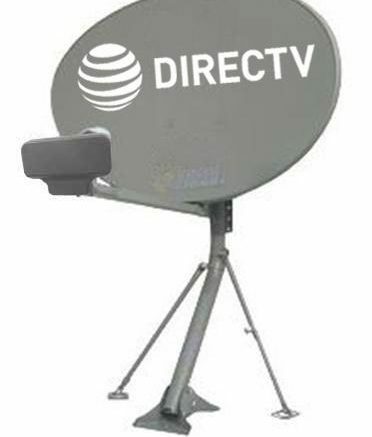 Eventually, DIRECTV got a fleet of satellites that operate in 4 primary locations. The map above (courtesy of Google Earth) shows the rough locations of those satellites. (There are also three other locations, at 72.5, 95, and 110 west longitude. 72.5 and 95 require a separate dish and 110 is now used for Puerto Rico.) This year DIRECTV will start broadcasting a completely separate set of signals from its 99 and 103 satellites, which use different frequencies than the regular ones. So you see it’s starting to get awfully complicated. The signals from the 5 different satellites hit the reflector in different places, then bounce toward the LNB. If the dish were smaller, the signals from the 110 and 119 satellite wouldn’t hit the reflector and they would be lost. Of course, this diagram simplifies things, but you get the point. The situation is worse for DISH, who operates two complete fleets of satellites plus a few extras. Because their satellites are further spread out, it’s far more common to see a two-dish setup on the roof for DISH than DIRECTV. There is some hope for DIRECTV subscribers. More and more satellite capacity is being shifted to the three major locations, at 99, 101, and 103 west longitude. 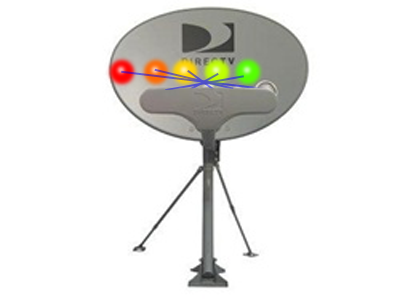 If you live in an area that requires access to only these three locations, you only need the Slimline-3 dish. (Click here to find out more.) There is no reason DIRECTV couldn’t create a smaller dish for people in the middle of the country who only need those three locations so maybe in the future, we’ll see a smaller dish. Until then, the receivers keep getting smaller anyway… and that’s something.